According to a dossier seen by The Sunrise, local contractors have united in calling upon the government to be patriotic by supporting and not dismiss local construction companies to undertake or partner in some of the road businesses. Rogers Mukalazi, a local contractor argues that the apparent dominance of Chinese firms has deterred the growth of local companies because many of them have been driven out of business and some have left the country for greener pastures. According to information from the Uganda National Roads Authority (UNRA), Chinese companies are currently working on a number of roads, some of which are fairly small projects and can very well be done by local contractors. Among the roads being worked on by the Chinese include: Acholibur-Musingo Road (86.4 Km), Gulu-Acholibur Road (75 Km), Olwiyo-Gulu Road (70.3 Km), Musiita-Lumino-Busia/Majanji Road (104 Km), Kanoni-Sembabule-Villa Maria Road (121 Km), Kiryandongo-Kamdini, Kamdini-Gulu, Pakwach-Nebbi, Gulu-Atiak, Atiak-Nimuli, Kigumba-Masindi-Hoima, Hoima-Bulima-Kabwoya and Kabwoya-Kenjojo. 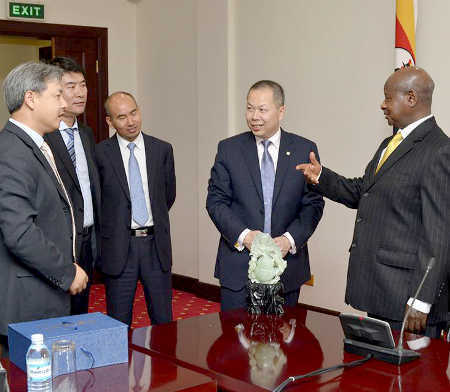 The Chinese are also working on the Entebbe Express Highway, in addition to other major infrastructure projects such as the Eastern Route of the Railway, several electricity dams and oil projects. In a not so distant past, a number of local companies won several contracts to build roads, these include Dott Services, Spencon, Cementers, Multiplex and Zzimmwe among others. Although a few like Zzimwe and Mugoya collapsed under the weight of debt and due to troubles that befell their founders, others have generally lost out to Chinese companies fueling anger among them that the government has generally neglected its own by not giving them business as well as building their capacity. However, Dan Kitakule Alinange, the Spokesperson of Uganda National Roads Authority (UNRA) – the government body that selects contractors, argues that they have chosen Chinese companies for most of the projects because of their capacity, technical competence and generally lower quotations compared to others. He argued also that local companies are not deliberately sidelined but rather lose out in an open and competitive bidding process. But observers, some of whom have spoken on condition of anonymity, partly disagree with Alinange. They argue for example that in some instances, the government hand-picks contractors instead of opening them to competition. 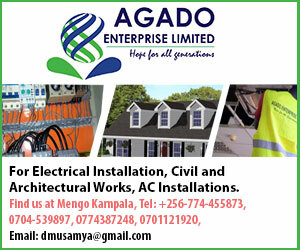 Dickens Kamugisha, the Executive Director of the Africa Institute for Energy Governance (AFIEGO) told The Sunrise recently that the government hand picked Sinohydro for the construction of the 600 Mega Watt Karuma Hydro Dam without competitive bidding. Another reliable source has told The Sunrise that the government dispatched a team to China to carry out due diligence on two Chinese firms China Civil Engineering Construction Corporation (CCECC) and China Harbour Engineering Corporation (CHEC) for the construction of the Eastern Railway Route. Although the government had awarded the tender to the later, CCECC went to court to contest the decision. Analysts observe that besides the Chinese firms’ indisputable financial muscle, that is backed by their government, Chinese firms beat their local and foreign competitors in giving bribes. The Sunrise cannot independently verify these claims, however, the black listing of CCECC, one of the major Chinese construction companies by the World Bank over fraud, perhaps lends credence to claims that Chinese companies indeed bribe their way to big deals. The World Bank black-listed CCECC not to engage in any of its funded projects until 2017, over fraud in a road project in the Philippines. Another claim by Alinange that Chinese firms are always thorough – to mean good quality work – has been disputed by some analysts who cite the shoddy work by Huawei Technologies Ltd in the laying of the Government Infrastructure back bone cable that was supposed to link the various government departments. Uganda’s Parliament investigated the US$106m project after the firm delivered poor quality work and missed the deadline several times. What is undisputed however is the usually huge technical and financial capacity of most Chinese firms. Because most of the Chinese companies are owned by the government, they find it easier to secure money from their government-owned banks. In some instances, the Chinese firms have the capacity to bankroll projects and send the invoice to government to pay later. Local companies do not have this financial muscle and they are usually victims of delay that leads to price escalation, besides damaging of their reputation. The disproportionate level of financial power between local and Chinese construction companies has led some observers to urge local outfits to stop comparing themselves to Chinese because of the vast differences in capacity. Mukalazi argues that the current Chinese dominance may still remain because of prevailing financial conditions. He says: “Sometimes government has to be loaned services or works under BOT (Build Own and Transfer) or BOO (Build Own and Operate) arrangements. Not many local contractors are in position to operate this way. Also because the local companies do not own as much as their foreign counterparts, access to credit facilities is limited hence unable afford certain performance bonds therefore loose at tender stages,” he says. Mukalazi throws the blame to his colleagues whom he acknowledges have disappointed both during tendering and implementation stages due to a number of reasons including incompetence, lack of proper documents, lack of good organisational structures, lack of management skills, dishonest, bribery and among others which in most cases has resulted into their being black listed because they do not know how to go about many issues. Mukalazi urges the government to categorize contractors based on experience and finance and make provisions for the small contractors to grow into bigger contractors. “Government can partner with local firms. Some of the local companies have capacity to loan services or works to government. “It should me a must for all foreign contractors to employ at least 60% of their staff as nationals at all management levels so that the locals learn from the foreigners,” says Mukalazi adding that government should make credit facilities easily available to the local contractors. During the reign of Syda Bbumba as Finance Minister, the government had mooted the idea of developing the capacity of Uganda’s local firms, through loan guarantees for assets acquisition as well as in encouraging partnerships with foreign firms. This proposal never saw grew to fruition and one hopes that in order to ensure the integrity of Uganda’s roads, this is an idea that should be looked into.